My proudest moment during the football season was learning to play a new position and starting at it. Ever since I was young, I always played quarterback but during my senior season after taking the previous year off, I took on a new role to help the team to the best of my ability. proudest moment on the court was winning the regional championship my junior year when we upset Burlington. It was an amazing victory since we were the 10 seed and they were the 2 seed. Individually, I am proud of being chosen to be a captain my senior year and selected to be on the All-conference team. Since I was little, I knew I wanted to play baseball for as long as possible. I have worked extremely hard in baseball, playing on travel teams and practicing throughout the off seasons. 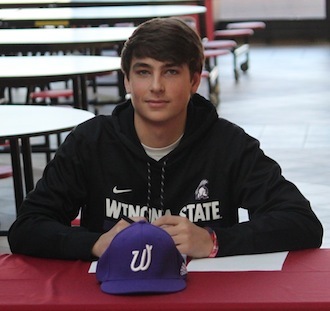 My proudest moment was when I was recruited and committed to play baseball at Winona State. I am fortunate and realize that all of my hard work paid off. Sport I find the most success in (and why): Throughout all my years of playing three sports, I have had the most success in baseball. I can contribute much of success to my dad. From a very young age, he has always encouraged me, pushed me to be the best, and worked with me the most in baseball. My dad, brothers, and I have spent countless hours in the cages and on the field working on my skills. Why I play three sports: I play three sports because I am extremely competitive and ambitious. I like competition, strategy, and being part of a team. Also, with playing three sports, I am always apart of a team and have a group of friends and teammates encouraging and supporting me each day. Favorite part of playing three sports: My favorite part of playing three sports is the group of friends that are on each of my football, basketball, and baseball teams. I have gained some of my best friends through sports. These relationships I have created on the field and court will last the rest of my life. I feel baseball is the most challenging sport to play. In baseball, you have to have trust that your teammates will be able to do their job. Also, in baseball you can’t just show up and expect to be able to throw strikes or hit the ball. These skills need to be practiced year round to be successful. Proudest academic achievement (and why): My proudest academic achievement was being chosen as the Wilmot High School Scholar Athlete Award winner and being able to apply for the WIAA Scholar Athlete Program. This was an honoring achievement because it revealed that I was capable of excelling in both academics and sports. I was proud to receive this award because it shows that my hard work in the classroom was recognized as well. The school subject I am most enthusiastic about (and why): The class I am most enthusiastic about is AP Economics. I have enjoyed this class the most because we are learning things that I have found a great interest in. This class is always full of energy. I am enjoying learning about economics, and I plan to take more economics classes in college and find a profession in the business world that I will greatly enjoy and excel at. Activities outside of sports and school: Outside of school, I spend time playing sports with my friends, including bowling, fishing, and ping-pong. I also work as a delivery driver at the Pizza Joint.